(seriously, we are just short of buying our Christmas tree the night before Christmas). 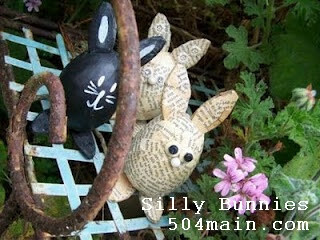 Last year I made these bunnies just in the nick of time, so while I prepare new crafty goodness for this year to celebrate SPRING, I thought I would share these guys again. 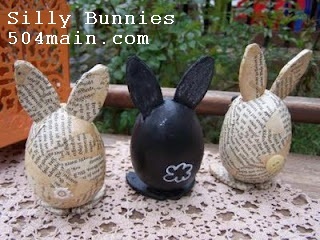 Apply a thin layer of decoupage on a small area of the bunny, let dry slightly. 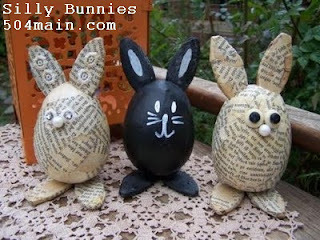 Apply pieces of torn book pages, overlapping the edges on that area - and applying decoupage on top of the freshly laid book pages; then continue onto other areas, until the bunny is covered. Make sure the entire bunny is covered in book pages and a layer of decoupage and let dry. Cut 2 slits in the top of the egg for the ears - I simply cut a slit...I did not make anything more than a slit...then pushed the end of each ear into the slit. I did not glue the ears in the stayed fine...you can glue the ears if you wish. Position two biscuits on the work surface so that the ends on one side are touching. About 1/2"in from the back point apply glue; place egg on the biscuit feet; let dry. For the chalkboard bunny, I simply drew in ears and a simple face. I eventually made a permanent face with a white paint pen. For the book page bunny, I used small lace flowers for the ears and eyes and a button nose; and for the other, just two buttons for eyes...and of course don't forget the tail! 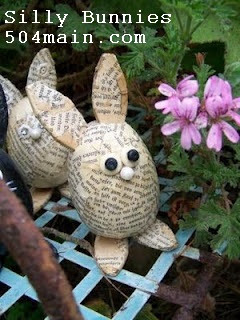 Note: glitter would be awesome on these little guys either for the ears, eyes, etc., or mixed into the decoupage! You can decorate these little guys anyway you want...I just stayed simple. do you need to get your tail movin' too? And linking to Lil Luna! 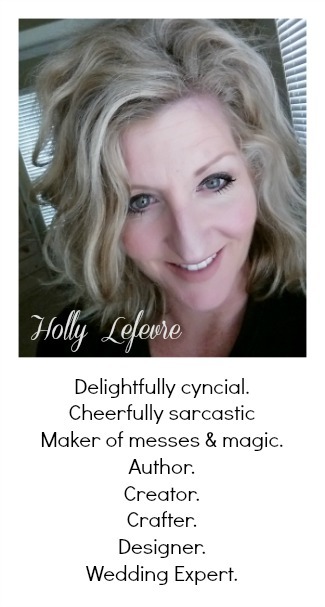 Lately I have been looking for different book page crafts. Thank you so much for sharing this. 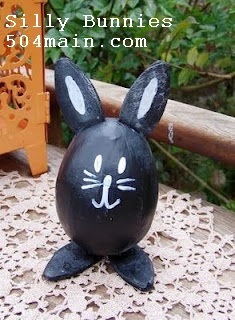 Sweet, cute and will be kept around even when it's not a bunny holiday! Your Silly Bunnies are cuties. As spring approaches I am planting delphinium seeds in the house in pots, and already planted a few potatoes in the garden. We hope for rain this month and next. Very cute! You always have the best ideas. How cute are these! Love the book page ones. I love these! I've been wondering when its socially acceptable to decorate for spring. Even though we had snow yesterday (in Portland?!) I think its ok now :) Thanks for sharing this cute idea! I like these but the hardware stores nearby sell the biscuit joiners in large containers. Oh well. Are there other projects I can use the biscuit joiners for?